SACRAMENTO, CA--(Marketwired - January 24, 2017) - Propel Fuels, the leading retailer of low carbon fuels in California, has won the 2016 Clean Energy Awards for Best Clean Energy Technology Innovator - California and Best Carbon Emission Reduction Tracking Platform: CleanDrive®. Hosted by Global Energy News, the awards recognized Propel for its unparalleled innovation in customer experience, mobile communication and retail technology leading to market leading customer loyalty and fuel volumes. Propel's CleanDrive is the nation's first integrated carbon emission reduction tracking platform, enabling individuals and fleets to measure the environmental and social benefits of using cleaner fuels. "We're honored to be recognized for our efforts," said Rob Elam, CEO of Propel Fuels. "Our branded network of stations has created a new consumer category in the multi-billion dollar retail fuel industry, redefining customer loyalty and breaking the stronghold of big oil brands." Propel is a low carbon fuels retail platform that solves the problems that have limited public access to alternative fuels. The company's unique business model offers established gas stations a new revenue stream by seamlessly adding the fuels with no cost to the station owner. Propel's customer base prioritizes better value, higher performance and healthier communities while exhibiting loyalty rates matching that of America's strongest brands, including Starbucks and Trader Joe's. Propel's CleanDrive, allows registered users to calculate emissions savings, and reports the results to a personalized or business online account. CleanDrive dynamically displays the positive impacts of low carbon fuel use, including reductions in CO2 and toxic air emissions. Millennials are Propel's fastest growth segment. Low carbon fuel consumers are highly diverse, representing the socioeconomic demographics of California including strong Latino, African-American and Asian demographic groups. Consumers are extremely loyal to low-carbon fuels, choosing Propel branded fuels 90% of the time. Because low-carbon fuels are more affordable than petroleum to mainstream populations and can run in a variety of vehicles, middle- and lower-income families, as well as young people, can afford these cleaner energy options. Propel was founded in 2004 with a mission to connect people to better fuels. 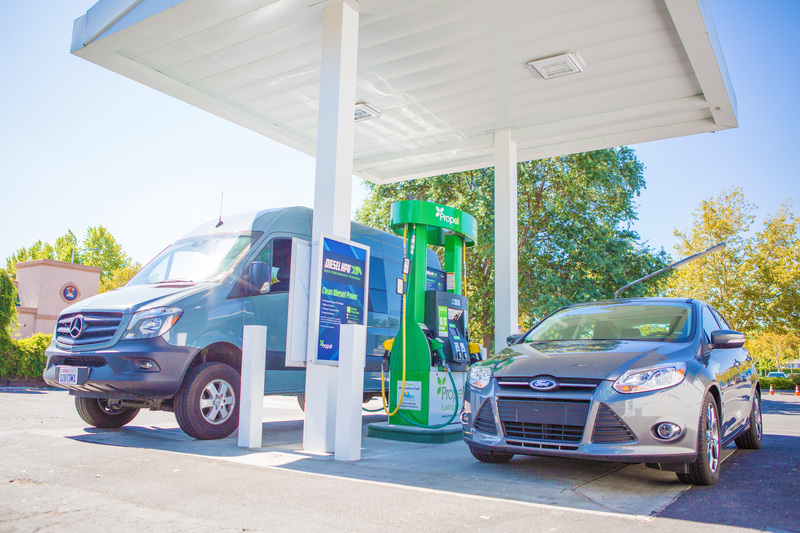 With 34 Flex Fuel and 32 Diesel HPR locations across California, Propel provides new fuel choices that are higher in performance, deliver better value and create healthier communities. Propel also provides commercial and bulk availability for business and government fleets. Propel ranks among Silicon Valley's top 10 private companies and is recognized by Inc. Magazine's "Inc. 500". More information is available at propelfuels.com and by following Propel at facebook.com/propelfuels and on Twitter at @PropelFuels. Locations and real time pricing can be found on Propel's mobile app in the Android and Apple app stores. Video testimonials from Propel customers are included in a new video "A day at Propel", reflecting the diverse ethnic and socioeconomic makeup of the company's customers.